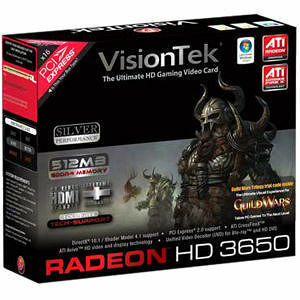 The VisionTek ATI Radeon HD 3650 Graphics Card enables you to experience the power of HD with graphics processing designed for entertainment and productivity. Experience the next generation of HD game performance and life-like realism thanks to DirectX 10.1 capabilities and plug-and-play ATI CrossFireX multi-GPU upgradeability. Watch the latest Blu-ray and HD-DVD videos in full 1080p HD - and upscale beyond - without placing huge demands on your CPU. Enjoy break-through efficiency from cutting-edge technology and new energy-saving features that help save you money and enable cool, quiet PCs.